Falalalala ... lalala ... laaaaaaaaa! 'Tis the season to be ... hohoho. Count down the days from now until zero. Yes, here comes Santa ---- or me, Sherry. 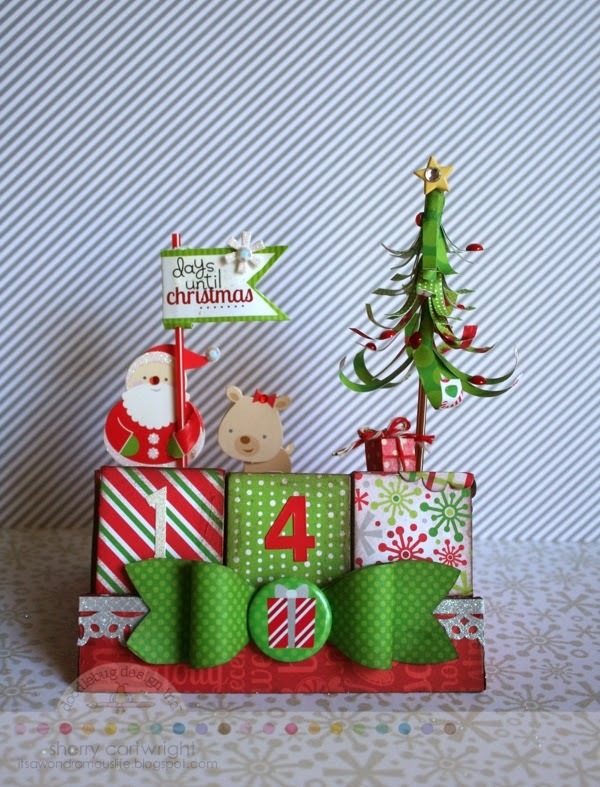 I'm here today to help you countdown the days until Christmas with this cute, re-purposed calendar. I know you'll not find one exactly like mine, but the idea can be carried over to any sort of calendar or item to repurpose. Oh yes, Christmas is just around the corner. To add more excitement to our home for the holidays, we always have some sort of holiday calendar for the kiddos to look forward to. We don't always have the traditional advent calendar of chocolate hidden behind the windows of the picture. Instead, in the past couple years, we've opted for a holiday activity for each day of December leading up to Christmas day. One year, the kiddos and I chose to decorate an ornament each day. This year, though, as the kiddos are getting a bit older and are involved in more activities, we're opting for a simple countdown calendar. 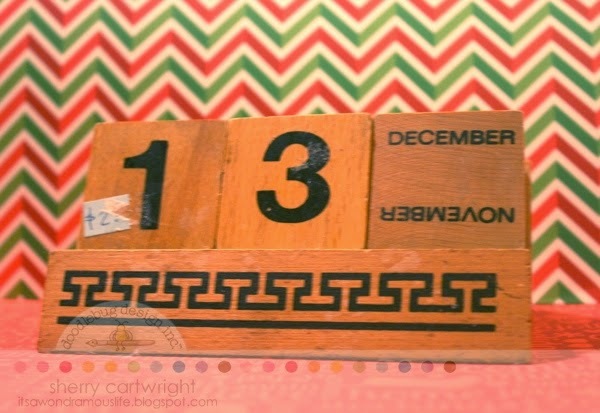 This simple wooden perpetual calendar was not so cute when I purchased it at the thrift store. When I purchased it, I had no idea what I would do with it. 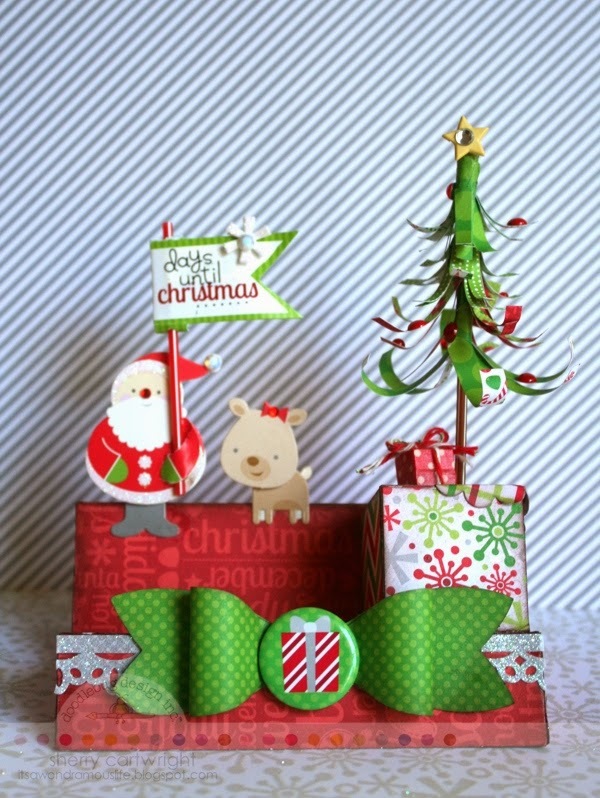 Once I realized that it could be turned into a countdown calendar, I set out for ideas and the Home for the Holidays Collection from Doodlebug Design. It has the perfect mix of traditional and trendy patterns and lovely shades of red and green and glittery goodness. I covered each block with a square of patterned paper that was inked on the edges. Then, I added numbers to each square face. The base of the calendar was an odd shape, so I simple traced it onto the backside of the patterned paper. Decorating the block with the tree was a bit more tricky because the is at an angle. But, let's talk about the tree first. I made the tree with a pixie [loooove them so much!] and patterned paper. I cut a rectangle of patterned paper about two inches wide and one inch tall. 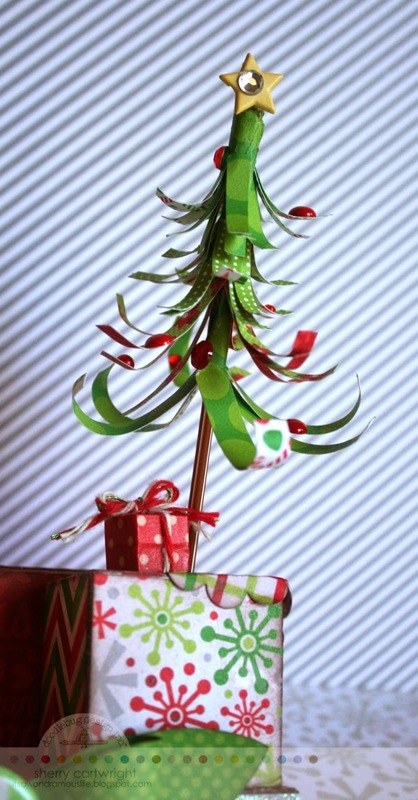 On one long side of the patterned paper, snip or fringe the edge of the paper. Glue one end in place on the pixie, then wrap around to desired look. Trim off paper and glue end. 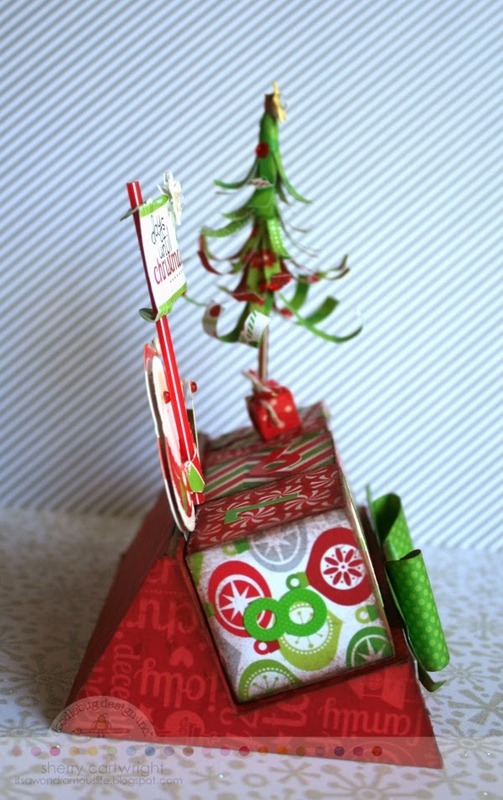 Once you've made as many layers as you'd like, use a stylus or paper piercer to curl the strips of paper. Embellish with brads, pearls, rhinestones and sprinkles. The present under the tree is a die/dice wrapped in washi and wrapped with doodle twine. For this particular project, I had to drill a hole into the wooden block to hold the tree. It had to be done at an angle as the base has a slight decline. Then, I embellished the stand with glittery adhesive fancy frill border sticker and a die cut bow. I added a cute doodad in the middle. Perfect! For a final countdown, what is three scrappy items on your Christmas wishlist? What are two activities you're looking forward to this holiday? And, what is the one ornament you have to put on your tree each year? While you're answering these questions, I'll be rockin' around the Christmas tree and dreaming of how I'll be deckin' the halls ... red and green and home for the holidays! Way to recycle, love it.